An enjoyable but effective story for helping little ones learn the importance of good manners! In this fun rhyming picture book, the bear wakes up with a growling tummy and thinks to himself 'I need some honey'. When he can't find any at home, he sets off in his car to find a hive. But with hives come bees, and bear soon discovers it is much better to ask nicely than to take what isn't yours! 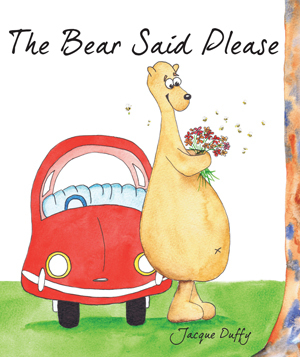 The story of a very hungry bear who discovers there's something he needs even more than honey – good manners! By Jacque Duffy, author of the That's not a ... series.